Looking for something funny to binge watch? Try Crashing on HBO Go. This series is produced by Judd Apatow and marks his return to HBO after six seasons of his critically-acclaimed hit series Girls. This time out, Apatow decided to focus on something near and dear to his heart, which is stand up comedy. Crashing is funny, poignant, and light-hearted while still having a storyline that is engaging. It’s also filled with plenty of cringe-worthy moments, one of Apatow’s signature motifs. With three seasons available on HBO Go, it’s the perfect thing to binge watch while waiting for Game of Thrones’ final season. The term “crashing” is used to describe when a standup comedian has a disastrous night on stage. None of his or her jokes go over with the crowd, which leaves a lot of dead air. The topic of social awkwardness is so pervasive in our culture that a style of comedy has sprung up around it. It’s called “cringe comedy,” and it derives its humor from social awkwardness. Shows such as The Office, Curb Your Enthusiasm, and Arrested Development all use various forms of cringe humor to entertain audiences. Just for the record, Crashing isn’t all cringe. Since this series is about and stars some of the best standup comedians in the business. 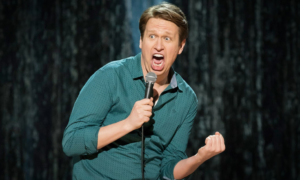 In fact, it’s main protagonist – Pete Holmes – is a well-known comedian whose downright hilarious. He plays himself in this series, which borrows heavily from experiences from Pete’s own life. We meet Pete in season one as a deeply-religious and awkward man whose dreams of becoming a standup comedian seem much bigger than his talent. The great thing about the Crashing version of Pete is that we watch him develop as both a comedian and person. I can’t say much more than that because I hold fast to my promise to never spoil these shows for you, dear readers. This stuff seems so authentic that I would be sure that much of the material is derived from Holmes’ life experiences, even if I hadn’t read that somewhere. The cast of supporting character is also amazing, including many top comedians such as T.J. Miller, Sarah Silverman, and John Mulvaney, among others. I realize why I appreciate Crashing so much. My viewing tastes tend to skew toward dark, heavy, and foreboding shows such as True Detective. Crashing was a welcome change because its fun, light-hearted nature was a palate cleanser of sorts. It refreshed and re-energized me after True Detective season three’s darker subject matter. That show is downright terrifying because it deals with tragedies that happen every day. Enjoy Crashing on HBO Go! That’s about all I have to say about this hilarious HBO original series. I definitely want you to join in on all the fun. (Maybe we could discuss our favorite characters, episodes, etc. in the comments section?) Just remember that the last episode of season three already aired but that doesn’t matter if you have HBO Go. You can literally binge watch all three episodes if you want. Frankly, I can’t think of a better program I’d want to see while waiting for the premiere of Game of Thrones’ final season. This one is easy to answer. It’s because I think some streaming services are the perfect complement to free antenna TV. Earlier this week, I told you that cord-cutting provides enough free TV to watch, and I stand behind that statement. The one thing cord-cutting cannot provide, however, is specific shows on networks outside your TV market that don’t broadcast free programming over the air. 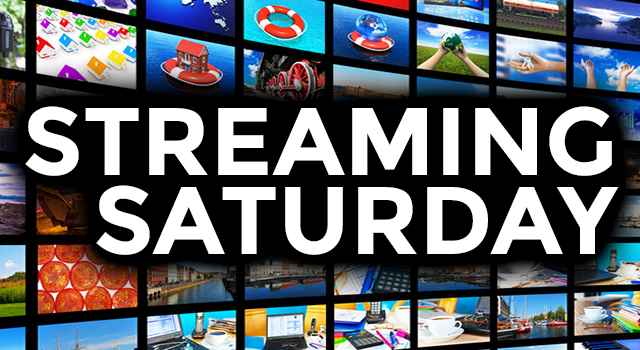 You know, shows such as Crashing, Game of Thrones, or anything else I’ve written about in this Streaming Saturday column. Look, there are many cord-cutters who are adding a streaming service to their antenna TV. With all the money they’re saving from not paying a cable company, they can afford to do this. In fact, many of these cord-cutters use the DISH AirTV Player, which combines free local TV, Sling TV’s national channels, and paid streaming options in one, easy-to-use menu. Does this sound like something you’d like to add to your home entertainment center? If so, just give Solid Signal a call at 877-312-4547. Our techs will answer all your questions about the AirTV Player and anything else cord-cutting related. A: If you already have a TV antenna, you’re halfway there. (Note: We also sell the AirTV Player as a package that comes with an indoor TV antenna.) It’s super easy to set up your AirTV Player. All you need is an high-definition TV set, broadband Internet connection, and power supply. The unit comes with straightforward, step-by-step installation instructions, and you can always call us if you need a little help. Q: Do I Need a Sling TV subscription? A: Technically, no. AirTV Player is optimized for Sling TV, a Sling TV subscription is not a requirement. You could simply use your AirTV Player to run your antenna TV and any paid streaming service you want, such as HBO Go. That said, we highly recommend you do get Sling TV because the average package offers 20+ national channels, depending on the package you choose. You can even try it with a free seven-day trial through the AirTV Player interface. Q: What HD TV antennas work with my AirTV Player? A: Any over-the-air (OTA) antenna with a coax connection is compatible with your DISH AirTV Player. You’ll just need an AirTV adapter to connect the antenna to AirTV Player. As we mentioned before, Solid Signal offers great pricing on an AirTV Player combo that comes with an indoor antenna and AirTV adapter. That deal is so hot you’ll have to call us to learn more about it. Oh, and if you need something stronger than an indoor antenna, we also stock hundreds of outdoor TV antennas. Again, all you have to do is call our antenna experts for the best product recommendation. A: There are no monthly fees with your AirTV Player. It’s much like a TV antenna in that you buy it, hook it up, and continue to enjoy it. There are monthly fees for the Sling TV subscription and any other streaming service you choose to add, such as HBO Go. But look at it this way, there’s a good chance you can afford these streaming services with all the money you’re righteously denying that greedy cable TV company in your area. Just saying! Q: What local TV channels can I get? A: This answer doesn’t change with the addition of your AirTV Player. You’ll receive whatever you were getting before with your existing antenna, or whatever your new antenna will get. They key here is to get your antenna from Solid Signal because our techs will recommend the best one for your area and specific installation. When you call for an antenna recommendation, our automatic goal is to get you the absolute most amount of free TV in your market. In many cases, we’re able to help people receive everything in their area simply by recommending the right antenna and other equipment. We can help you make the most out of your free antenna TV experience too!